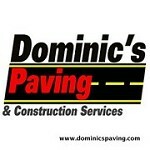 Dominic’s Paving: Dominic’s Paving Joined Storeboard! driveway paving, local paving contractor, local asphalt contractor, driveway paving company, driveway repairs, driveway repair company, asphalt sealcoating, parking lot resurfacing, parking lot striping, parking lot paving, commercial paving, commercial paving company, pothole repair, parking lot repair, parking lot repairs, local driveway repair company, residential paving, residential paving contractor, residential paving contractors, general contractor, GC for paving, local general contractor, driveway sealer. Dominic’s Paving was established in 1996, and the owner, Dominic Stanley, is a third generation paving contractor. For more than 20 years, Dominic’s Paving has provided people in Maryland, Virginia, and the surrounding areas with exceptional customer service and superior products. We have received 97 percent favorable reviews on Angie’s List from past clients: Such a sterling statistic speaks for itself! Our reputation as a premier paving contractor is driven by results. Check out this recognition! We received Angie’s List Super Service Award in 2012 and again in 2014. We are the highest rated local Angie’s List contractor. Dominic’s Paving has also been featured on HGTV’s Curb Appeal, drawing national attention! From the first time a customer contacts Dominic’s Paving to the completion of the project, customers will talk directly with Dominic. He understands how important it is to provide customers with the high-quality, competitively-priced service and products they need. Dominic is reachable on his cell phone to answer questions as they arise for clients. He goes the extra mile, and it shows in his integrity at every turn. Dominic’s Paving is state certified and licensed. We are MHIC certified contractors. We have received Angie’s List Super Service Award in 2012 and again in 2014. making Dominic’s Paving the highest rated local Angie’s List contractor. Dominic’s Paving has also been featured on HGTV’s Curb Appeal, drawing national attention! Our company was showcased on installing a custom colored asphalt driveway, walkway, and a Japanese rock garden.